The world's largest amethyst geode was a little smaller yesterday after a tourist visiting the cave where the huge structure is kept snapped a bit off. 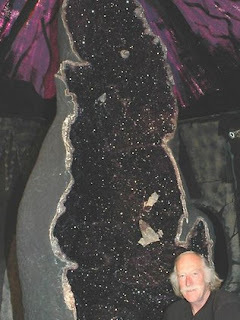 The owners of the bright purple geode - a hollow rock 327cm tall, filled with amethyst crystals and named the "Empress of Uruguay" - discovered it had been vandalised on Monday. "It's like slashing the Mona Lisa but worse because the Empress is one of nature's grand masterpieces," owner Rene Boissevain said. The thief, who was caught on CCTV, removed a chunk of crystals the size of a tennis ball. The security camera footage was given to police. The geode - which weighs about 2.5 tonnes - was found in Uruguay and then shipped to Australia to become the star attraction at the Crystal Caves near Atherton, about 1,800km north of Brisbane. Crystal Caves website said the owners -- who were long-standing customers of the mine where it was found - paid US$75,000 for it in 2007 and spent another $25,000 moving it to Australia.